The Ram 1500 has a modern cabin that's equipped with premium amenities, including a signature infotainment system with navigation. The Laramie, Rebel and Big Horn are some of the trims that are available for this robust vehicle. A 12.0-inch display with split views is available in this light-duty pickup truck. 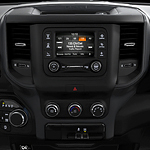 Having the Uconnect 4 design, this touch screen clearly displays maps and other graphics from GPS navigation software. If you want to obtain the latest information on traffic flow, sign up for the SiriusXM 360XL application. Conveniently located between the air vents in the central console, two fast-charging USB ports are compatible with a wide range of mobile gadgets, including smartphones. You can also plug in an MP3 player or another audio device into the conventional auxiliary port near the USB slots. Leckner Chrysler Dodge Jeep Ram has a large inventory of RAM 1500 models for sale in King George. Visit us to buy your next light-duty pickup truck at a great price.